Welcome to Jackson Hole Trading Post & Gem Mine. We're located in waterfall country 1/3 mile above the breathtaking Cullasaja Falls on Hwy. 28 & US 64 halfway between Franklin and Highlands, NC on one of the most scenic byways in the USA. Jackson Hole Trading Post & Gem Mine has been Family Owned & Operated since 1977. We offered the cleanest mine around with a covered flume to search for your treasures rain or shine. Jackson Hole Gem Mine from Time Capsule Video on Vimeo. 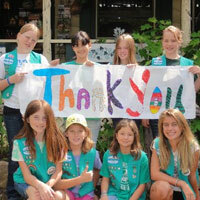 We host groups, parties, boy & girl scouts, family reunions, and more! We can cut and set the gemstones that you find! Sit in covered comfort and mine for your treasures. Find your gems in rain or shine. We are free from the "red clay mud" that so many of the other mines have you walk through to get to the sluice. Our mine features native & enriched gemstones. All equipment is supplied and we offer friendly assistance for the inexperienced. Jackson Hole Gem Mine is open for the season. Be sure to call for hours. Off season hours vary so please call to verify (828) 524-5850. Receive 10% when you mention our website!